Ranger John is at it again! This snake is probably the last one that we will see this year, because the temperature is steadily dropping, and they are getting ready to seek shelter for the winter. 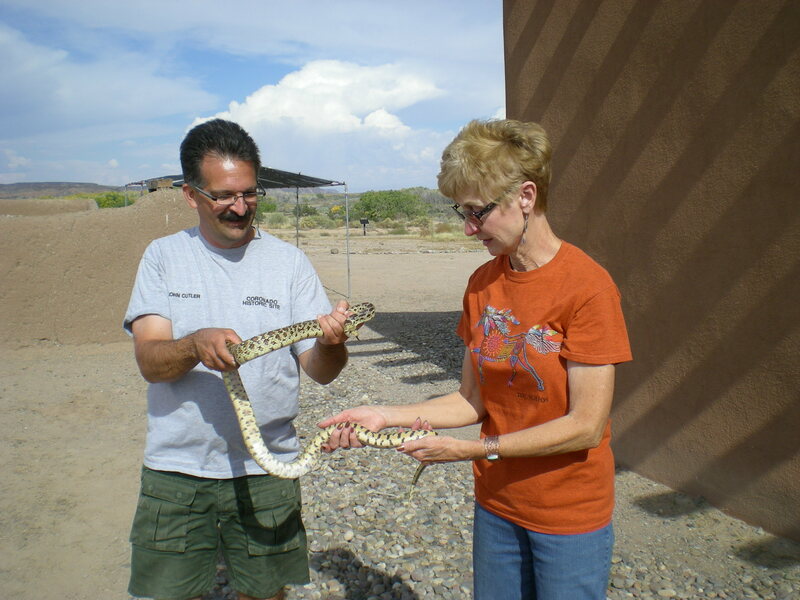 Volunteer Carolyn was very interested in this bull snake, and commented on how beautiful it’s pattern was. We found this snake the day after the Fiesta of Cultures, and he probably was hiding in a hole waiting for the hundreds of visitors to dissipate. After snapping a few photos, and letting all of the interested individuals get a peek at the snake, Ranger John released the snake, which quickly bolted for the nearest hole, but the hole proved to be too small for the large snake, and though he thought he was well hidden, we could clearly see where he was! As always, Ranger John knows what he is doing, and we do not encourage people to pick up snakes! Tags: Animal, Animals, Bull Snake, Coronado Historic Site, Kuaua, Nature, New Mexico, Ranger John, Snake, Southwest, Wildlife. Bookmark the permalink. The ‘ Bull Snake ‘ does not welcome ‘ Rattlers ‘ into its habitation area. Which do you see more of within the Kuaua site?